Having never been to Fort Lauderdale before, I didn't quite know what to expect. 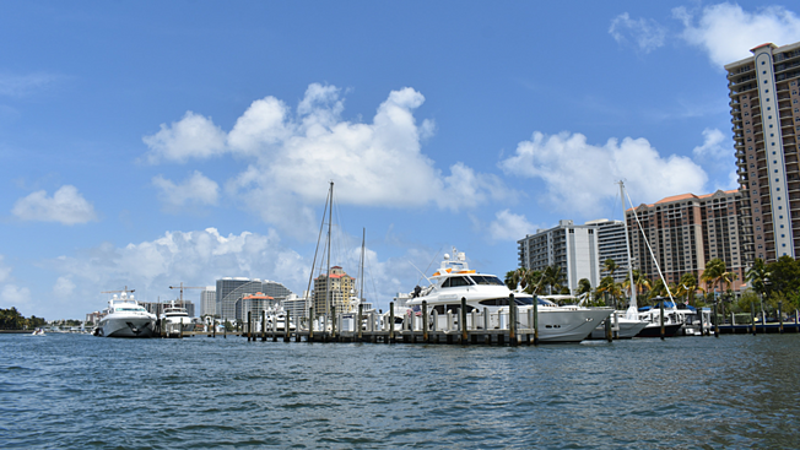 I assumed from tales of the Fort Lauderdale Boat Show and friends' chartered deliveries that the city was similar to other boating meccas: numerous harbors, marinas, sailors, boats – the usual. But the "Venice of America" managed to surprise me with how fun it was to survey by dinghy the "floating city’s" abundance of inlets, dockside restaurants and businesses, hidden gems, and well-known sites. 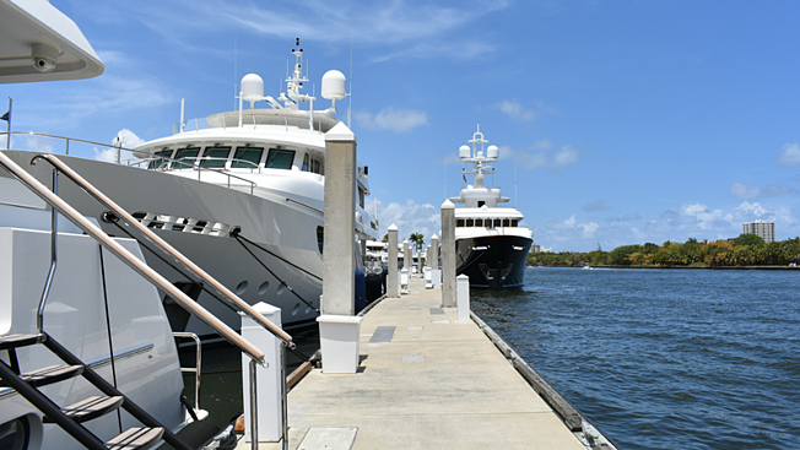 Our blog posts often highlight specific events and activities, but in this case the most fun was simply dinghying from bar-to-bar and dock-to-dock with friends as we explored new restaurants, gawked at Fort Lauderdale mansions, and laid claim to our future mega yachts. What did we miss out on? According to Wikipedia: 3,996 out of 4,000 restaurants, 63 golf courses, 12 shopping malls, 16 museums, 278 parkland campsites, and 131 of 132 nightclubs. 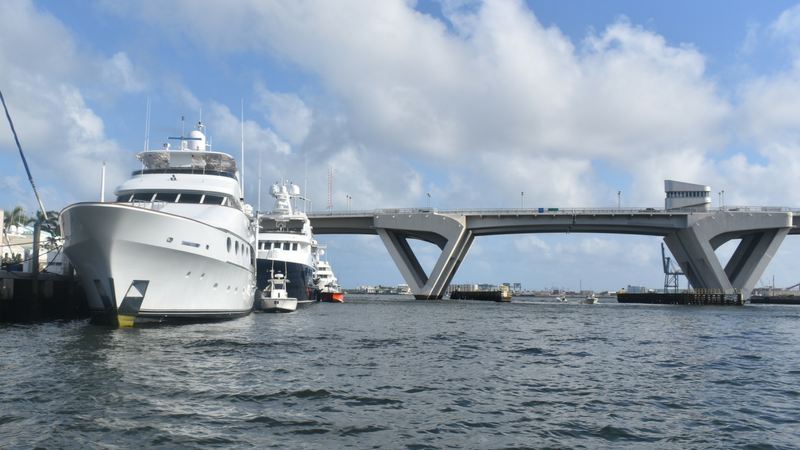 The Stranahan River entrance to the channels of Fort Lauderdale is no stranger to handling boats on a grander scale. It's home to Port Everglades, the world's second largest cruise ship port. 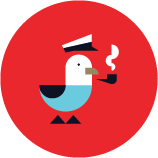 The channel is wide, deep and well marked, depositing you right into the heart of the Venice of America. To the south, cruisers will find Dania Beach, Hollywood, and after 25 miles, Miami. 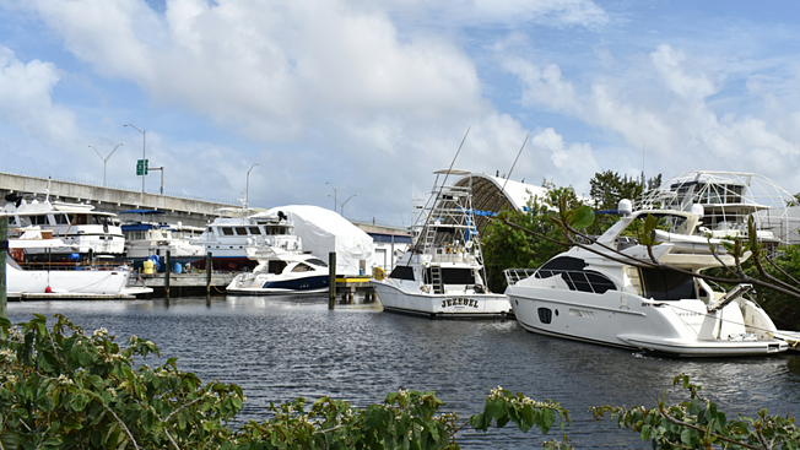 To the north, Pompano Beach, Boca Raton, and – a bit of a hike at 44 miles – The Bluffs Marina, a favorite hurricane hole marina in Jupiter, Florida, just north of West Palm Beach. Heading north of the Stranahan to Tarpon River and South Fork New River, you’ll find Marina Mile Yachting Center. Off the beaten path but worth the voyage, MMYC is more secluded and affordable than marinas downtown, and offers a full-service, 6-acre boatyard, including dock space up to 150', an extensive marine contractor network, security, and deep water working dockage. Bahia Mar is a quaint little spot, isn't it? We took a spin down the river and spotted the dinghy dock pictured above, chock-full of tenders. Where could they be keeping their real boats? we thought to ourselves. 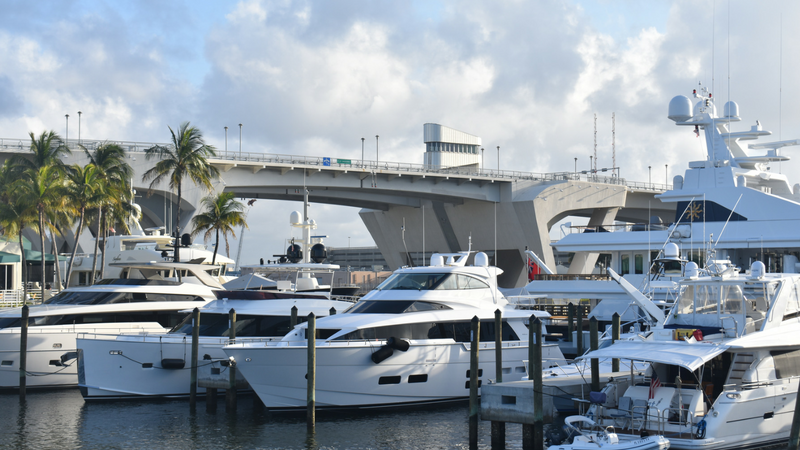 The marina offers 250 slips capable of handling vessels up to 300 feet along its 3,000 foot parallel dock and more than 5,000 feet of floating docks. Bahia Mar is kind of a big deal. 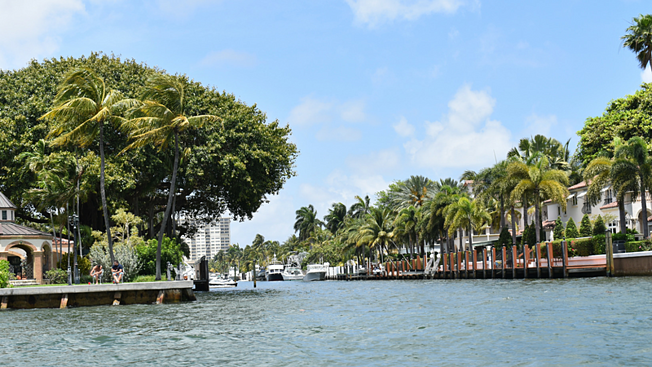 Less than a mile north of Bahia Mar, Las Olas Marina & Mooring Area sits pretty on both sides of the Las Olas Bridge. Their 66 transient slips make up the bulk of it to the north, with two small-boat docks for day-only tie-up under the bridge and one more just south of it. Las Olas Marina & Mooring Area offers pump-out at each slip, fixed concrete docks, nearby grocery (Publix is 1.5 miles away) and restaurants. These options, along with the temporary anchorage area, allow for convenient access to Fort Lauderdale Beach. Hyatt Regency's Pier 66 in Fort Lauderdale is south of Bahia Mar and Las Olas, and just north of the 17th Street Bridge. For cocktails or a fine dining experience, I highly recommend their on-site restaurant, the Pelican Landing. Further north from Las Olas, we stopped by Sunrise Harbor Marina to visit another lovely little boat, the M/V Name Withheld. I took a spin around the docks, which is a bit of an undertaking with 2500 feet of parallel dockage. 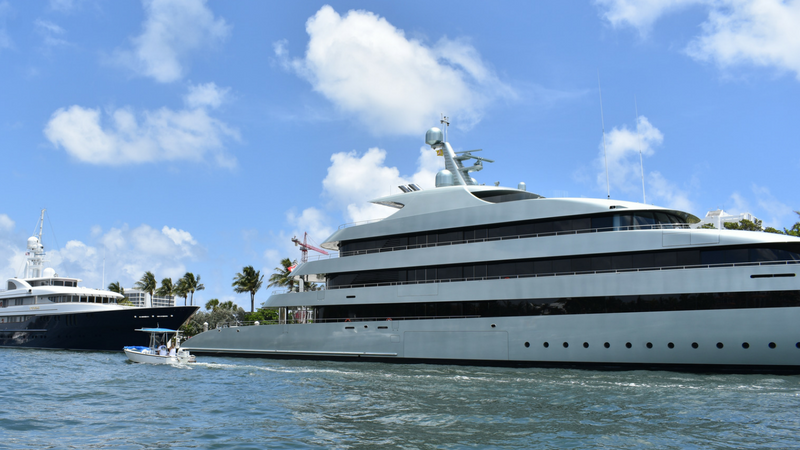 Sunrise Harbor's heavy concrete floating docks can accommodate more than 22 mega yachts up to 200 feet. For a brunch reminiscent of hipster-haven Cambridge, MA, we took a 5-minute Uber down St. Andrews Ave to Tap 42. A big outdoor patio, indoor-outdoor bar, solid food, indie playlist, and your typical breakfast cocktails expertly made. 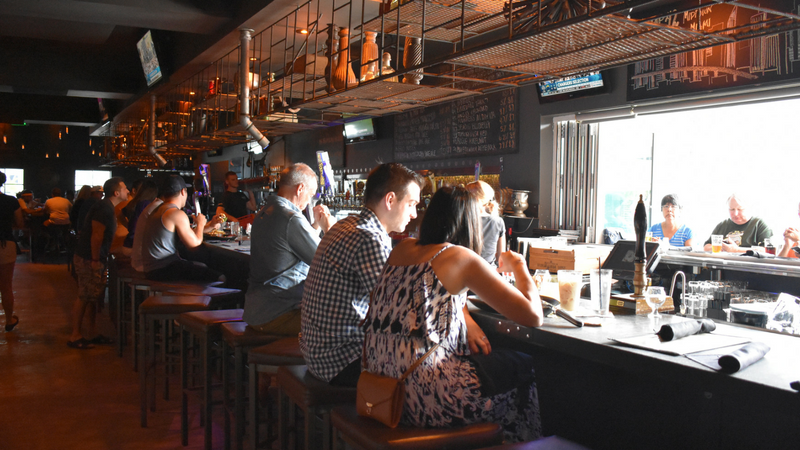 For a night on the town, the patrons at YOLO know how to party and the staff is more than happy to help them do just that. One last suggestion: Visit Coconuts! Tie up at the dinghy dock and walk right into a relaxed atmosphere full of friendly waitstaff, refreshing beverages, a ring-side view of boats cruising by, and coconut shrimp. If there's a wait, you may find quicker seating (and more shade) next door at G&B Oyster Bar. 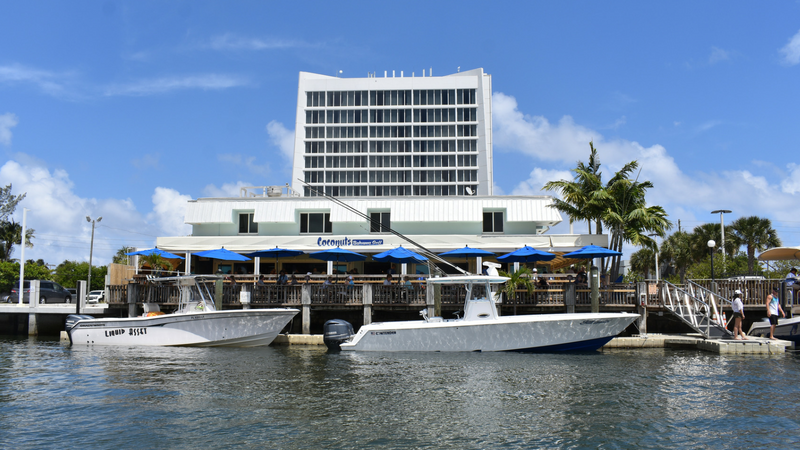 Want to see more Fort Lauderdale marinas on Dockwa? Of course you do. Tell'em it's free and send‘em our way. Share the link below and we'll make it happen.